One of my good friends sent me this question yesterday: "I have a meeting this Thursday, and the dress is business casual. This event, however, is usually exclusive to MBA students. In other words, a professor vouched for me, a brilliant undergrad, and I don't want my professor to regret the decision. How do I optimize my first-impression potential?" Well first off, it's a good sign that you're putting some thought into how you'll dress to the event. Not only for your own benefit, but to ensure that someone who put their neck out for you will be glad that he did. First impressions count and people will be judging you by the clothes you wear, whether you (or even they) know it. 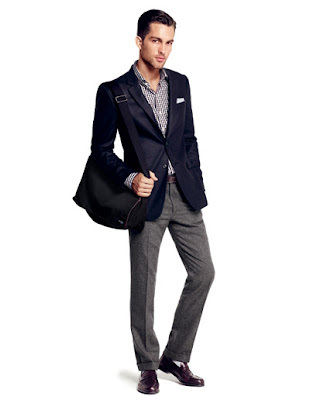 The rules of business casual have changed in the past 20 years, sometimes not for the better. While some people consider it appropriate to wear a polo and jeans or even a t-shirt (yikes) to work every day, upgrading your style is the first step towards upgrading your career. Unfortunately the fact that business casual has no fast rules means that it can be difficult to decide what is really appropriate. I'm going to show you three great options for a "business casual" dress code that make you look like a professional without going for a suit. A navy blazer is essential to any man's wardrobe, but to really pull off a great business casual look you'll want to make sure it is tailored well. Make sure that when you button it up it tugs slightly around your waist, the sleeves should show about a half inch of shirt cuff and make sure it is not too long. Notice that the man in the picture below isn't wearing a tie, but he still looks professional. They key is in the details: brown leather shoes, a white pocket square and smart grey wool slacks make this look impeccable. If you haven't had the chance to invest in a well tailored navy blazer yet, a merino wool v-neck sweater is your next best option. Go for a muted color such as navy or grey, you can get a little bolder with the shirt underneath as all that will be showing is the collar and cuffs. Notice the similarities between this picture and the previous one. Once again, the keys are in the details. It's imperative that you pay attention to all pieces of your outfit, particularly shoes. Fashionable, well-made shoes that will last for a decade or more are a worthy early investment and should be part of your wardrobe as soon as possible. Khaki pants get a bad rap thanks to poorly fitted options that flood the marketplace but chinos with a trim fit and proper break over the shoes are a great piece for business casual. Go for something that has a flat front (no pleats), slight to no break over your shoes and a crisp crease on the front. If you're not willing to throw a blazer, sweater or vest over your shirt you should probably throw on a tie. Layers are sophisticated and signal that you take the time to consider your appearance rather than just throwing on whatever is available to you. Don't forget that a leather strapped watch is the best looking accessory you can own. As usual, the imperative of great fit is more important than anything else. Note that all the options shown fit the man in the picture perfectly with no bunching, folding or rolling on any of the fabric. Ensure that your fit is perfect and all else will fall into place. Thanks for reading. As always, be dapper. Sweaters have received a bad rap for a long time as the less sartorially inclined have only considered the crew-neck sweatshirt their only option. 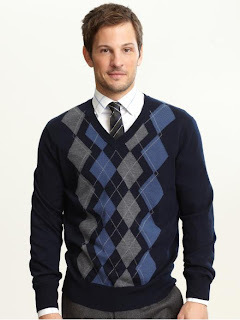 However, a sweater is one of the smartest and most versatile pieces of a man's wardrobe for fall and winter. Today, I want to show you three stylish sweaters that you'll want to add to your lineup immediately. This is an absolute necessity for any man. Really, if you don't own one yet you need to make sure you buy one today. Don't go for the cotton option, they're a little too thick to use all year round (which you can with merino wool). The v-neck merino sweater will become your go to layering option, especially for the office. 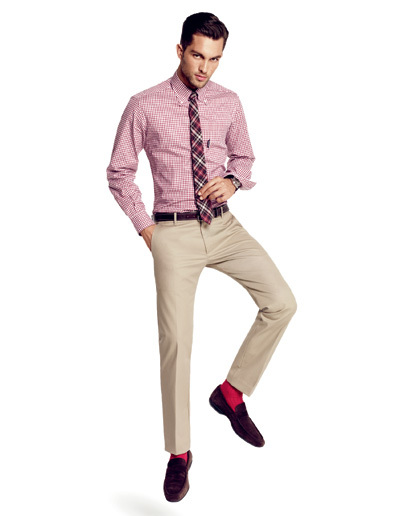 Pair it up over a shirt and tie and you will be amazed at how much your look is elevated. Also, throw a blazer over it as well. The great thing about merino wool is that it is thin enough to have additional layers over the top without turning you into a fountain of sweat. Equally appropriate at work and at home, the cardigan is a great look for a guy who is looking for something that makes a bit more of a statement than the v-neck. While some would not consider the cardigan a professional look, I dare you to don a shirt and tie below one and ask yourself if you don't look good enough for the office. Don't be afraid to go with a bold color if you already have a few other more subdued options in your wardrobe, cardigans are a great way to pop some color into your winter wardrobe. More of a casual look but still stylish, the shawl collar is very much in style right now. While there are many options for a shawl collar sweater, I like to go with something a little thicker. Layering over the shawl collar can get a little too busy around the neck so I prefer this style stand on its own. You can go for a pullover, but I like the look of a buttoned front (really it's still a cardigan but the style is so different it deserves separate mention.) If you go for something thick, you'll look equally appropriate chopping lumber as you would out for an evening stroll. By the way, the sweater below is only $19.95. What are you waiting for? 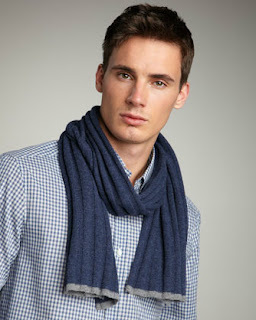 Scarves are a great accessory for men, just as much as they are for women. 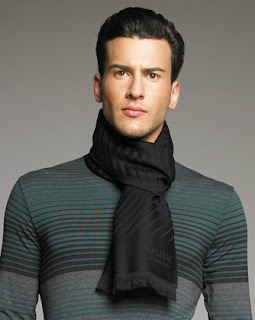 Many men hesitate to don a scarf, but scarves are a great complement to your outerwear and are a perfect way to inject some color and bold style into the mostly drab colors of winter. Not only that, but scarves keep you warmer than you might think, so they are just as utilitarian as they are fashionable. After you've found yourself a great men's winter coat, it's time to top it off with something that you can make a statement with. Today I'll show you three ways to tie men's scarves (and some great buying options) that will keep you warm and stylish through the winter. Anytime I am wearing a jacket or outwear with lapels, I use the Tie Knot. While not particularly difficult to tie, the hardest part of perfecting this fashionable scarf knot is to make it look like you really didn't even try to tie it. That said, the Tie Knot makes a bold statement as it is much more chunky and noticeable than the Parisian or the Once-Around. To make a Tie Knot drape the scarf around your neck and cross one end over the other, pull the front end of the scarf up through the crossover and let it hang. Voila, you've made a Tie Knot. It's even bold enough to pair up with a stylish men's hat. My go-to knot for scarves, the Parisian Knot is easy to master. 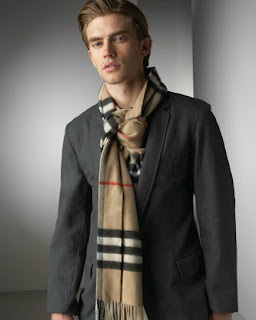 Simply fold your scarf over itself length wise, wrap around your neck and pull the loose ends through the loop. The key to getting this knot to look great is to knot have it flat around your neck as you tie it. Let the scarf pile up and create some texture. Also, this knot is easy to tuck inside a jacket on extremely cold days. This knot looks great over sweaters and is also a great choice over a slim-fit shirt. The Once-Around is a great choice for extra cold days where you really need to warmth provided by a scarf. Easy to make and here's how: hang the scarf around your neck with one end longer than the other, then take the long end around your neck and let it fall over your chest. That's all. You can also do a Twice-Around by wrapping the scarf around your neck twice. A great choice for crew-necks and Mandarin collar jackets. Fall is almost upon us and it's time to start getting your fall/winter wardrobe out. I love this time of year and what it allows me to do with my wardrobe. Between the layering options, different textures and fabrics available and the seemingly endless amount of accessories available to you, fall is the best time to make a statement about your own personal style. Of course, with the cooler weather you're going to want to keep warm and a classic, stylish jacket is the perfect way to do that. Today I'll show you 3 timeless jackets that are a perfect addition to any man's wardrobe. The peacoat has its roots with 19th century European sailors, originally cut from a fabric called p-cloth. The fabric was coarse and was designed to repel water and keep the sailors dry and warm. However the style took to land and has stuck ever since. Peacoats are always double-breasted, have big collars and usually bold anchor buttons. It's all part of what makes the peacoat so recognizable. Keep in mind that this is not a jacket to wear with your suit, peacoats are cut short and your suit jacket will pop out of the bottom. These days peacoats are available in a huge variety of styles, colors and fabrics but I like to stick to classics. 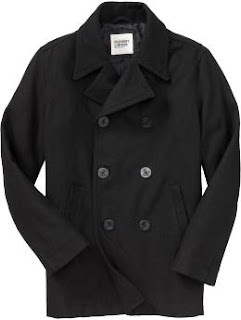 Now normally I'm not an Old Navy fan but I picked up this wool blend peacoat for only $50 last season and it is great. The cut is surprisingly fitted and it is incredibly warm and comfortable. It's available again this season so jump on this one when you can find a discount deal, Old Navy has them all the time. 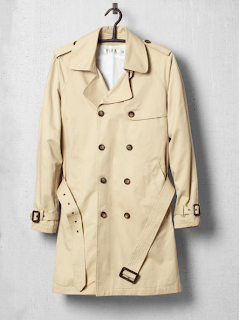 Similar in style to the peacoat, the trench coat was originally designed by Burberry for officers of the British Royal Army. The trench is recognizable by being cut longer (sometimes all the way to the knees), including a belt, epaulets, a button yoke on the back shoulders and a buttoned flap over the right shoulders. Trench coats are also generally made of a lighter material than peacoats, with modern versions incorporating many synthetic fabrics into their construction. Often the biggest question of style when wearing a trench coat will come down to your belt: do you tie it? buckle it? hang it in the back? I see it as a matter of personal preference, experiment and see what you like most. If you really hate the belt, take it out and cut off the loops. I've already gone in depth into How to Buy a Leather Jacket, but it's worth another mention in this article because the leather jacket is an essential addition to any man's wardrobe. If you're really too lazy to go read that article, I'll give the short version here: make sure it fits snug, keep it simple without a lot of embellishments and try out a brown jacket before settling on black. That said, I think the most classic leather jacket look for fall is a bomber style, pictured below. Just rebellious enough to get a second glance, but conservative enough to take to the office.